BURO-GDS Inspirations/ Ellen Tongzhou Zhao: Similarities? Left is a wall graphics designed for the French Institute in New York by Studio Philippe Apeloig, designed in 2005. Right is a detail from the flyer for the 2008 Bicycle Film Festival. 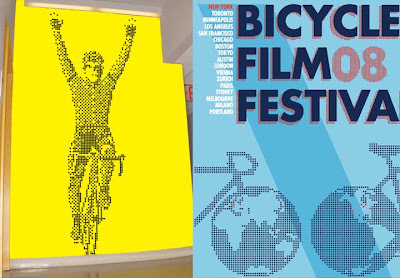 I love biking and films, but doesn't the graphic design for the flyer look very different from the BFF identity and inspired by the FIAF wall graphics?